Jim Clancy works for CNN. He is, according to some, a seasoned journalist. What he is not, apparently, is a tolerant man. If you dare to disagree with him, question him, criticize him, you are erased from his world, denied access to his most valuable snippets of 140 characters or less – you are, in Twitter words, blocked. Jim Clancy has spent quite a bit of time this afternoon blocking Israeli tweeters because they had the audacity to disagree with him. First by pointing out that the cartoonists who were murdered by Islamic extremists yesterday were exercising their freedom to speak out. Rather than agree with that concept, Clancy attempted to deny the very nature of the works themselves. It all started with a tweet…it always starts with a tweet. Now, what I got from that quote was the concept that perhaps had the cartoons mocked the “Prophet” as Clancy writes of Mohammed, than perhaps the attack that resulted in the murder of 12 innocent people might have been justified, but since they only mocked how some Muslims, according to Clancy, distort Mohammed’s message, than the terror spree was wrong? And an extraordinary thing happened…the jerk blocked me. In one of several tweets, Jim Clancy argued against those who showed that this was not the first time that extremists had attacked the magazine. 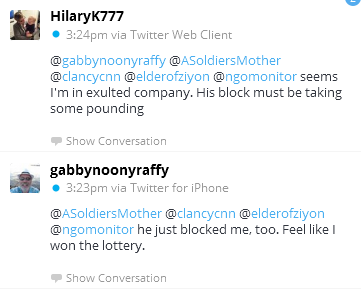 Several pro-Israel bloggers attempted to show Clancy that he was wrong. One even posted an earlier Charlie Hebdo cartoon PROVING Clancy’s inaccuracies. His response was to have a temper tantrum that would make any two year old proud. He lashed out against pro-Israel bloggers – accused them of being anti-Muslim and continued by attempting to belittle them with outright lies. In one case, Jim Clancy referred to a well known blogger and tweeter, accusing him of only having a few followers when the man has well over 12,000. I went to look for his original tweet and realized he’d blocked me. I also realized that I am now in a most honorable group of people Jim Clancy blocked for daring to question him. Jim Clancy may have 50,000 followers on twitter, but what he lacks is a sense of honesty and a willingness to apologize when proven wrong. Several bloggers have written about this – each offers a glimpse of a man who no longer commits himself to honor in journalism. What does it say about a man and a journalist when his efforts are spent more on trying to defend his error, rather than in admitting it? When he feels his best defense is to take the offensive against people who simply challenged his error? And how can such a man be allowed to think that spewing lies and accusations against Israel by bringing up settlements as a means of discrediting people, is acceptable in a discussion that centers on a terror attack by Islamic extremists in Paris? And if this is how Jim Clancy behaves, how can anyone think he can report news and truth with any semblance of balance – at least when it comes to Israel and Jews? One cannot help but look at Jim Clancy to realize that this is not the first time, and even more sadly not the last time , that Jim Clancy will run to launch an attack against Israel rather than admit the truth. Personally, I think CNN’s best bet is to reassign him to Micronesia.